Clinton M Model Upholstered Mat Platform Tables are available in a variety of sizes. 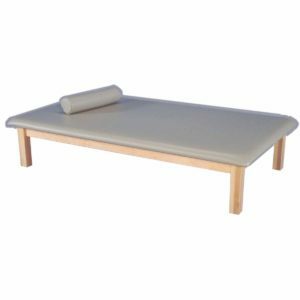 Steel angle, hardwood legs, and solid veneer core plywood create a solid base and 2\” of firm foam gives plenty of patient comfort. 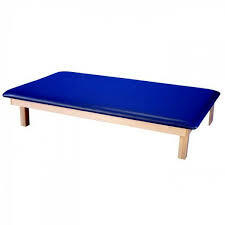 Clinton MC Model Folding Mat Platform Tables are also available in multiple sizes. Space saving mat platform requires only 8\” of floor space when folded and is ideal in applications with limited space. The upholstered section folds down easily for use. Folding solid hardwood legs, a center support, and a full backwall make for a secure yet comfortable working surface.